A very popular Italian recipe. 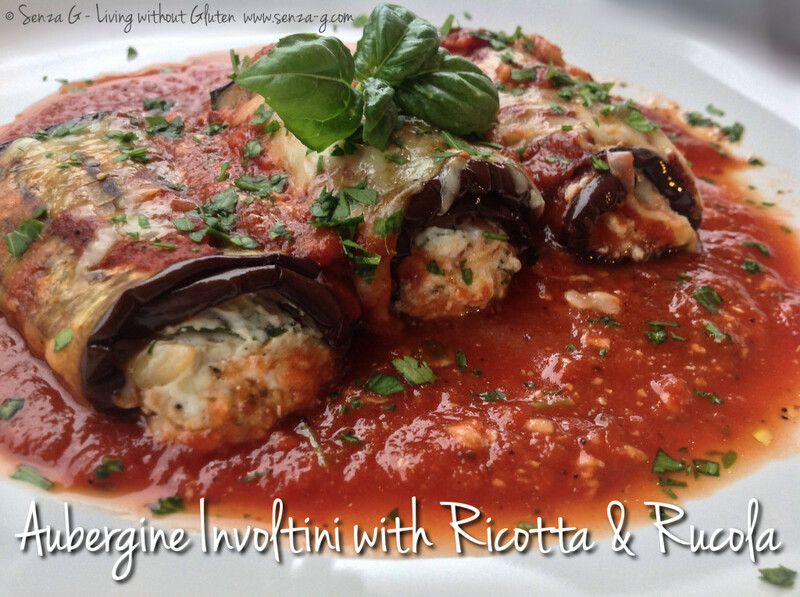 Perfect for us Celiacs as they are similar to cannelloni but are made with aubergines instead of pasta. Sooo yummy! Slice the aubergines lengthwise. Using a grill pan, cook the aubergines on both sides in olive oil. Set aside. Use the longest and widest slices for this dish. In a bowl, combine the ricotta with the chopped rucola, a tablespoon of Parmesan cheese, salt and pepper and the beaten egg. Take an oven proof dish and cover the bottom with half of the tomato sauce. Take an aubergine slice and place some ricotta mix at one end. Roll it up and place in the oven proof dish. Do the same with the aubergine slices and ricotta. Place the remaining tomato sauce on top of the aubergine rolls. Grate some fresh Parmesan on top and place in the oven for a few minutes until it is heated through and the cheese melts. Serve garnished with fresh basil leaves.